Click the link below to gain instant access to my free Planner Lovers Resource Library, where you can download your bullet journal blog planner layouts. One A4 PDF file contains both layouts – ‘Blog Ideas’ and ‘Blog Post Planner.’ Print the document at 100% and cut out the two designs (trim just inside the pale grey lines to remove them). Each layout measures 120mm x 190mm which will fit neatly into a large Moleskine Notebook (the notebook I am currently using) or Bullet Journal. For an easy way to stick these straight into your notebook, print onto adhesive paper to create stickers. If you love to hand-draw layouts, simply use these printables as a template, or as inspiration for your own hand-drawn design. Add colour or extra decoration. 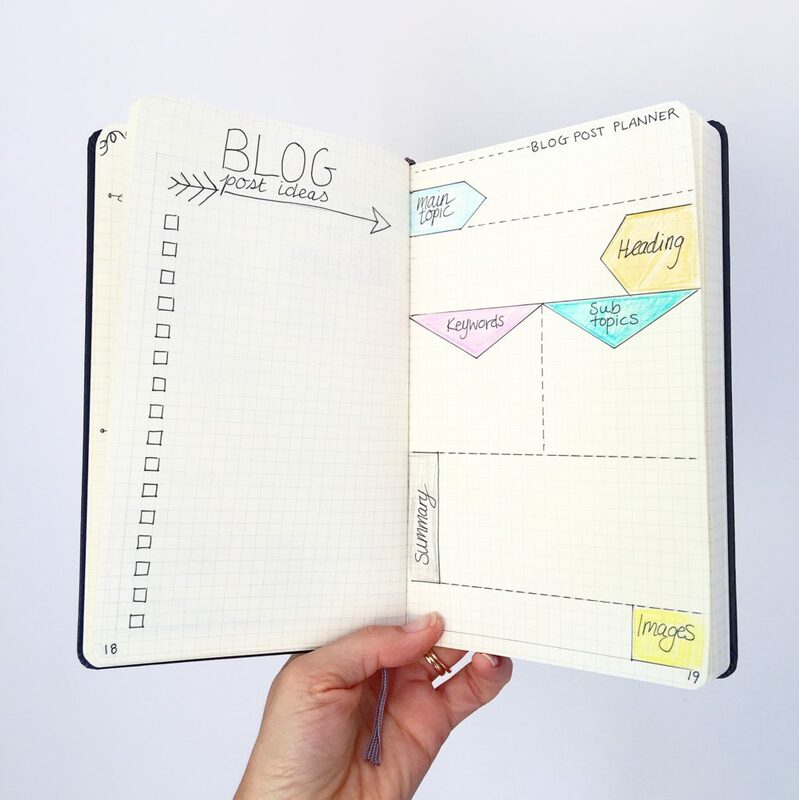 Keep a few copies of these blog planning layouts ready to go in your journal. When an idea comes to mind, jot it down immediately on the ‘Blog Ideas’ page. Then expand on these ideas using the ‘Blog Post Planner’ page. Jot down all the important parts of a post – heading, keywords, sub-headings and a summary. Write the page number of each Blog Post Plan next to the corresponding idea on the Blog Ideas page. This turns your idea page into an index just for blog plans and makes each plan super easy to locate. Plan ahead and you will never be short of blog post ideas again!